I had fun making this dress version of the Tie Back Top pattern #107using the plum and cream print from the current collection. Not only do I love this print, but the weight and drape of this lightweight jersey is perfect for Tie Back Top turned Dress and the summertime weather and events! I spent about an hour and a half one evening laying the pattern out, chalking the new length and getting it cut out. It was ready to sew when I arrived at t he studio the next morning. Nice! It had been a while since I used the Tie Back Top pattern and I was impressed with how well it went together and the instructions! I know that must sound strange since I did the pattern making, wrote and illustrated the instructions (with the help of my friends Jan and Cathy)!) I did read and follow the instructions step-by-step. Why reinvent the wheel !!? I did not make many changes to the pattern, most notably, it was lengthened. I decided on my finished length and hem width then simply laid my long straight ruler on the cutting line of the widest part of the hip and matched it with the new hem length and width mark and drew an new side seam and hem. I did also shorten the sleeves to below the elbow. I thought about eliminating the ties in the back by shortening and tucking the ends into the side seam and sewing them in but I thought for summer it would be fun to have the tie back. I am planning on making a sleeveless version that can be reversible ( two dresses in one!) using one of the prints and an ITY solid coordinate. The dress took me 2 hours of sewing time. So that is 3.5 hours beginning to end. Keep in mind that the dress is self-lined to hip-length and some fabrics could be too bulky or heavy. This fabric is lightweight with excellent drape and a comfy "slide-on" feeling! Have fun sewing one of these fun summer dresses for yourself! Here's a sewist tutorial on that tie back top, thanks Diane! When I first saw this graphic print fabric I thought of Diane Von Furstenburg and was excited to make a garment with her in mind. I really like how it came out and I think she would also! At first, I cut out the center front panel in the print fabric then thought how great it would look with a solid panel. I looked through the current collection of fabrics and decided on the turquoise (ITY1030). The weight, color and drape were a good match for the lightweight sweater knit (PRT1045). This lightweight, stable sweater knit is a dream to work with and does not stick or cling at all. I was recently asked (thank you for the question!!) if this tee pattern would make a good dress. I had my reservations about how the center vertical panel seams would hang at dress length so I had to give it a try! I think it drapes very well by simply lengthening the pattern from the hem (not the lengthen/shorten line). To give a bit of extra hip and hem width I added a few inches of a-line on each side seam. 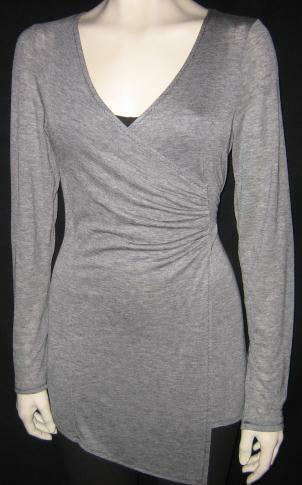 I love the simplicity of this neckline construction. It could not be easier or more fun to realize for the first time how it sews together! I lowered the V 1.5 inch for a more summery effect. This is as simple as sewing 1.5 inches down from the large dot given. Isn't that a beautiful back and shoulder neckline? Super quick and instant gratification sewing! I made the Double Collar Jacket using Double Knit fabric in 4.5 hours start to finish. The simplicity of the pattern and the qualities of the fabric made the construction a breeze. I find this a very versatile wardrobe piece. Typically, I would sew a size 12 for this jacket if I were making it in a woven fabric with no stretch. I wanted a snug (not tight) fit to access the qualities of the double knit, so I cut a size 10. The sizing was perfect! The fabric is heavy enough, the stretch and recovery just right and the curvy-ness of the pattern enough, so that when I button jacket it hugs my curves in a very flattering way. Use the tissue pattern measurements/Perfect Sizing Worksheet to guide your sizing choice. I would make a quick sample jacket (front, back, sleeve) in a woven fabric then decide size for the double knit. I serged the forward shoulder seams, side seams, princess seams, center back and collar together. I used my single needle machine for basting the collar to the neckline and for attaching the facings to the jacket, both around the neckline and the center fronts. The single needle machine gives me just a little more control at these key areas, and reduces any unwanted stretching/curving on the long center front seam. Stitch with the interfaced side up. The serged seams pressed beautifully and quickly. Once pressed in place, I use my hands to set the press until the fabric cools a bit. I used a small ham for the bustline curve and the sleeve caps. I added soft, covered Velcro shoulder pads just to square off the shoulder line. I tried on the jacket after pressing and turned up the sleeve hem and decided the pattern length was to my liking. I topstitched the hems in place. To tack the facing to the jacket I pinned it in place and stitched in the ditch from below the bustline curve to a few inches above the hem, and also at the forward shoulder seam a couple of inches. I chose five beautiful etched horn buttons and made the buttonholes. I used my fusible tricot interfacing for the facings and found that it stabilized the buttonholes (and the jacket) sufficiently. In retrospect I may have made corded buttonholes just because they are so beautiful and really do stop any stretching of the buttonhole. I decided that the fabric might be a bit heavy for the double collar, so I opted for the single collar. I did not interface the collar. This jacket is instant gratification sewing. What I love about sewing is that I made something so nice in such a short amount of time with no complications. My patterns and fabrics are designed with that in mind. Sewing can and should be that way. There is nothing better than planning a trip and then deciding what you're going to sew to wear on it! From beach vacations, to city touring, to exotic locales, sewing your own travel wardrobe is very enjoyable! Plus, then you can clear out some of your fabric stash so as to justify buying more while you're traveling. Travel Trio Three is a great pattern for cooler-weather locations and seasons. The pattern consists of two variations of tops - a raglan sleeve tee and a turtleneck with a unique shirred front panel. It has an A-line skirt either with or without clever pockets, and a ruana, which can be made in many fabrics, or even two knits so it's reversible. The skirt can be made knee length or midi length. Try knee length for wearing with ballet flats or sandals, and midi length for flat tall boots. Imagine yourself sitting at the Trevi Fountain in Rome. You're on the edge of the fountain, dressed in the shirred turtleneck, skirt and have the ruana draped over your shoulders, with one tail cascading around your neck. You catch a glint of the sun, look up and your travel companion snaps a photo of you, serene, sophisticated AND comfortable! That's the kind of experience you want traveling - you don't want fussy clothes, but ones that feel effortless when you put them on. AND you know you're keeping up with the stylish Italian women around you. And you want to be able to jam a bunch of these comfortable garments into a travel cube, and into a backpack and tour like a local. You'll wear one complete outfit on the plane to your destination (saving suitcase space). We recommend the raglan tee, ruana and skirt with leggings and boots or booties. Wearing your heaviest/largest shoes on the plane is smart, so you don't have to carry them in your bag. If it is going to be cold at your destination (or your departure), wear the Easy Coat and layer the ruana over it. Check out some sample garment inspiration right here.